Google Maps reckons it’s a 10-minute walk, but with close to 40 light-based artworks floating, glowing or nestling along Fitzroy’s edgy and eclectic Gertrude Street, two hours was closer to the mark. And I’m sure I missed some. But playing ‘spot the work’ along the way, festival app in hand, was part of the fun. From seductive optical candy to the thoughtful, the political and the quietly sublime, this year’s Gertrude Street Projection Festival (GSPF) continued its development as a diverse creative platform for the conceptual, the spectacular and the collaborative across its 10 mid-wintry nights. With civil twilight descending just after 5pm, mid-July Melbourne is perfect for an outdoor projection festival—wind, rain and single-figure temperatures aside. Gertrude Street is a concentrated location, the street itself providing some serious competition for the artworks. It’s a gritty, graffitied mix of hipster shopping strip and public housing precinct, dotted with bars, cafés, social services, galleries and hair salons, strung alongside a slow-flowing river of trams, bikes and cars. Lots of visual and aural distraction: moving headlights, constantly shifting noise and quirky store displays. But with a bit of online guidance, there was plenty of gold to be discovered within the busy substrate. Here are a few samples. Brianna Hudson’s Place of Longing was arresting for both its subtle colour and shining Romanticism. Utilising light not to dazzle but to brush its pastel warmth against a pale laneway wall, Place of Longing depicted an ancient landscape slowly drowning in smoky, peachy skies. A near-static, painterly surface of shifting tones, it silenced the din of the street; inner-city grime giving way to Romantic nostalgia, lost forests and dissolving clouds. Gabi Briggs’ Urala, sited amid a group of gum trees at the frontage of the Atherton Gardens public housing estate, used video footage from the recent Forced Closure rallies, projected against a carpet of paperbark and sand. Subtitles were included in Vietnamese, Arabic and Mandarin, aimed at creating dialogue between these local communities, as well as in Briggs’ own Indigenous language, Anaiwin. 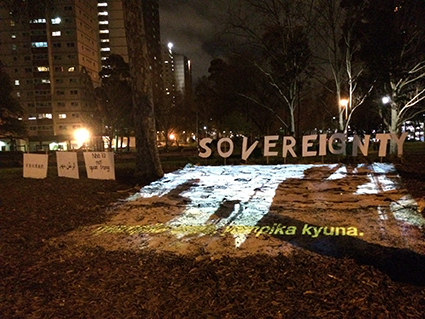 Behind the horizontally projected video, large letter-signs spelled out “SOVEREIGNTY”—the only English word in the piece. In a location where a long history of urban Aboriginal community intersects with those of recent migrants, the disenfranchised and the upwardly mobile—under a stand of trees suggesting a time before white settlement—Urala was spot-on in calling attention to notions of place, community and ownership. Briggs was one of four artists involved in GSPF’s Mentorship Program this year; another was Atherton Gardens resident Guled Abdulwasi, who worked with projection artist Nick Azidis to create giant ‘dark’ images on the side of the estate’s multistorey apartment buildings. I spoke later to GSPF co-curator Yandell Walton about the festival’s aim to bridge the social divide between housing estate and café strip. She cited festival projects including the mobile exhibition space Artbox Truck, situated within the housing estate, and presentations of performance/projection installations as well as an open projection night, Video Jam—which “allowed the exchange of ideas on a public art platform from the local community.” A ‘choose your own adventure’ work was also created around the estate by local youth theatre company Uprising Theatre; sadly, I was unable to catch these works but their inclusion augurs well for increasing connections across Gertrude Street’s many communities. The New Vanguard exhibition, at Gertrude Street’s Seventh Gallery, showcased the work of five artists; drawing some 4,300 visitors during the festival, according to Walton. She and exhibition co-curator Arie Rain Glorie were keen to encourage the general public into a gallery space. 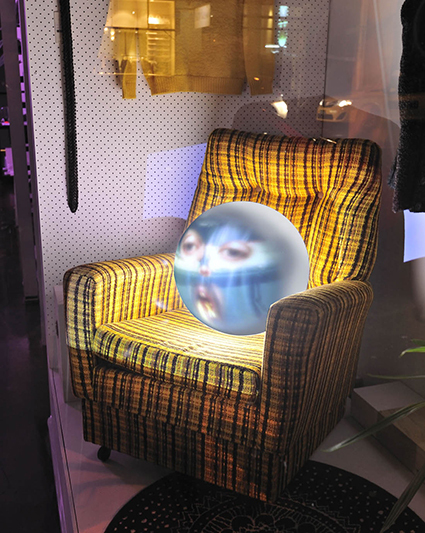 Walton said, “For visitors to the festival to be exposed to conceptual works…this show was also about embracing projection as more than a medium used as spectacle…” From Tara Cook’s hovering, saturated, shadowy figures on a portrait-format video screen—who turn out to be ourselves, the viewers—to Zoe Scoglio’s bubbling, rumbling electronic paste-up of geometric shapes, stone, water, grain and flow (titled Water Falls and Other Features), The New Vanguard expanded the festival’s brief to include the projection of ideas: a counterweight, as the curators’ statement suggests, to the constant projected suggestions of advertising, politics and the “busy world” we’re constantly caught in. Amid mesmerising façades of swirling psychedelic colour and sneaky infiltrations into shop windows, two relatively ‘traditional’ works stood out while also fitting seamlessly into GSPF’s overall blend. Half-obscured inside a clothing store, Federico Winer’s Ultradistancia was no more than a vivid slideshow of enhanced aerial stills of cities, landscapes and roadscapes; studies in line and colour that were, nonetheless, just too good to pull away from. Similarly, in the front windows of Gertrude Contemporary, dance-filmmaker Sue Healey’s simply but perfectly realised film portrait of dancer Benjamin Hancock, from her On View series, drew a constant crowd of watchers, as Hancock moved and swayed like a tai-chi master or praying mantis, meeting our gaze as he floated, uncannily close to life-size, upon a dark and seemingly infinite background. And of course, there were the works, as always, that revelled in the mystery, pleasure, play and playfulness that participation in GSPF invites. Freya Pitt’s Fortune and Love Favour the Brave created a “Fake Hole” in a laneway wall: a metaphorical ‘lack’ into which was projected an animated reflection on desire—complete with photo-collaged angel lovers flexing their wings, riding on rocks and clouds and seemingly helpless amid their world of starscapes, graphics and flowing ribbons of text. 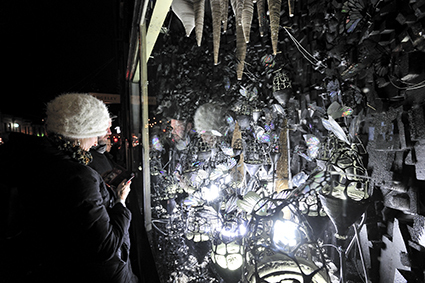 Nearby, Victoria University’s engineering- and science-based collective Skunk Control utilised stark white light on black to create a magical, surreal grotto, Secluded Evolution, full of bizarre alien flowers in black metal, centres glowing with sharp monochromatic patterns. Upon them, black mechanised butterflies rested with transparent, stencilled wings pulsing, catching the light and splitting it into subtle prisms. Children and adults alike were transfixed. It’s impossible to cover even a substantial number of GSPF’s works in a short review, or to convincingly generalise on the themes and ideas at play. Walton saw, overall, a desire by artists “to investigate ideas related to technology itself,”mentioning works like Dalton Stewart’s painting/projection work Ontology, which “blurred the boundary between materiality and virtual space through the convergence of painting and projection.” I saw ideas-based work; work in which light was merely an element; work in which light was both primary medium and focus of investigation. The works that stood out for me were those that evoked other artforms, times, places; merged with and utilised the surfaces they played upon or the 3D spaces in which they sat; and gathered an energy—whether quietly or spectacularly—that overrode the peak-hour traffic and nippy weather. It’s a hard call to bring together the rough edges and consumer culture of Gertrude Street, but the high-rise flats, the bundled-up pre-schoolers, the commuters, locals and the dancing colours all seemed to be embracing a good time.